Caleffi 6686D5S1A-58 PEX Tubing Manifold 4 Port for 5/8 Inch PEX Pipe and includes 8 adapters. Caleffi Radiant Heat PEX Manifolds are for PEX (PEX-A, PEX-C or PEX-B) and are used for radiant floor heating. 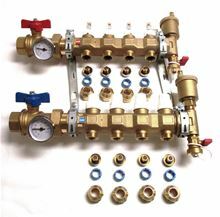 The Caleffi 4 Port Heating Manifold for 5/8 Inch PEX Tubing comes with PEX adapters, Temperature Gauges and supply and return ball valves. Optional accessories such as Caleffi Actuators, Caleffi By-Pass Valves and more are available. Please note, these manifolds are only used for hydronic heating systems and only for PEX-A, PEX-C or PEX-B PEX Tubing. How much water is there in different sizes of PEX Tubing?